Modern Nymphing - An Examination Catch more trout with nymphs. Before there were bobbers called strike indicators, there were anglers dead-drifting weighted flies along the bottom and catching fish by feel. One of these anglers was a guy who fished Montana/Wyoming named Charlie Brooks, who in the mid 1970's wrote a book called Nymph Fishing For Larger Trout. Charlie used scuba gear and watched both trout and wet flies from under water. His observations and writing were very revealing. Charlie used both floating and sinking lines to fish nymphs. His flies and fishing techniques were proven in Montana, but were also deadly on Oregon rivers such as the Metolius and Deschutes. I became to him an unknown disciple, and even though I never met Charlie, my copy of his book became worn with reading and rereading what he had to say. Me and my friends terrorized the local trout using his fishing methods. 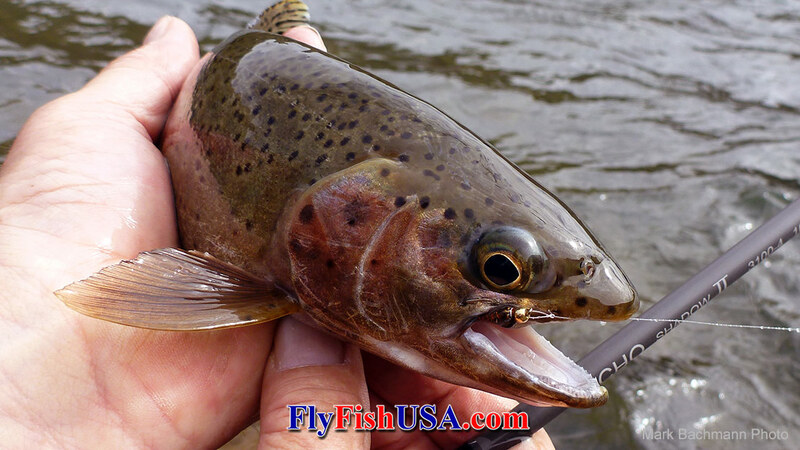 It became clear that the standard eight foot long dry fly rod wasn't the perfect tool for this type of fishing. Longer rods gave advantages. During this period I built my own rods and my rods got longer and longer. In the early 1980's I was building rods on J. Kennedy Fisher blanks, and asked them to build me a 12-foot 5-weight graphite blank. The the rod that emerged was an instant success in that it allowed me to cover a lot of water while using a very short line, thus being able to fish weighted nymphs very close to the bottom in moving water in a very life-like manner. Pretty quick friends wanted the advantages that this long, lightweight rod provided, so I started buying blanks, building rods and selling them. The production lasted only about a year, an produced only about a dozen rods. Then J. Kennedy Fisher went out of business. No other rod builders would build blanks for me at a price I could afford. I approached several rod companies to build rods that I could sell, but the idea never caught on. Finally my own long nymph rod wore out and the whole idea disappeared. About ten to twenty years ago competition trout fishing became popular in Europe, especially in Eastern Europe. For a time, Czech and Polish anglers won most of the tournaments and their techniques were much copied. Very few American anglers were interested in fishing competitively, but some noted that these professional anglers from Eastern Europe could catch a lot of trout in a comparatively short period of time. Nothing breeds interest like success. Anglers, such as Andy Burk started pushing the European techniques and tackle because they were so productive. Fishing with multiple nymphs can even land more than one trout at a time (pictured above). It is well known that trout feed mostly below the surface of the water during all times of the year. Even when there is a major hatch taking place, trout often feed on nymphs as they leave the bottom, rather than adult flies at the surfaced. In many places 80% of the average trout's diet is taken within a foot of the bottom. Probably at least half of that is eaten three to six inches from the stream-bed. After years of ardent nymph fishing it becomes clear that the best place present my nymphs was at the bottom of the water column. This is where the majority of behavior drift takes place, and this daily redistribution of stream bed insects is very common, especially during low light hours. Water is 800 times denser than air. Therefore flowing water molecules create more friction on each other than they do against lighter-weight air molecules. In many rivers, most of the places where trout live, about 90% of the water velocity occurs in the top 10% of the water column. As water gets deeper it also gets heavier, and creates even more friction. A stream bed is like a piece of giant sand-paper, so a river flows the slowest near the bottom and fastest is at the surface. 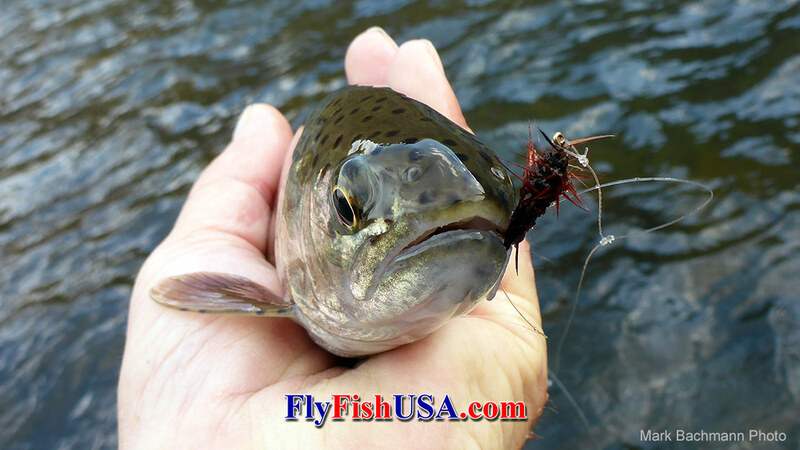 This creates big problems for anglers fishing their flies near the bottom of any river. The speed of the surface currents want to pull the flies down stream faster than they would move naturally if they had no line attached to them. This is called "drag". Trout, when pressured by anglers on public waters learn to detect drag, and they avoid flies that are moving un-naturally. Thick fly lines create more drag than thinner monfilament. The trick is to make your flies move (drift) down a river next to the bottom as thought they had nothing attached to them. 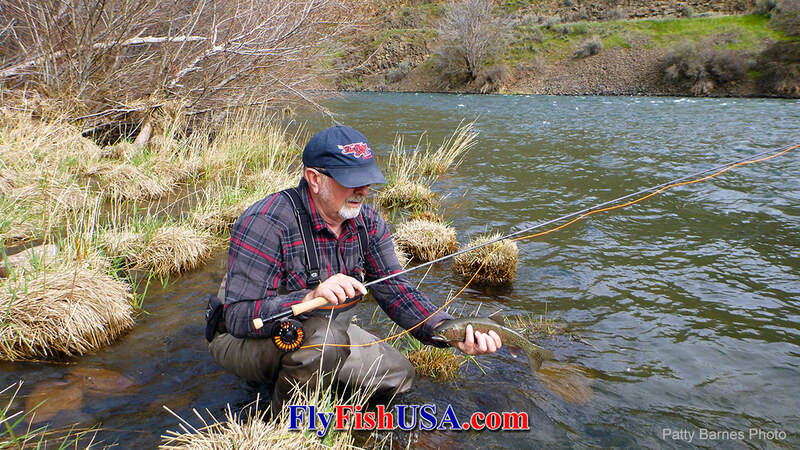 Keeping a thick fly line off of the water helps reduce drag. It is always easier to control a short line rather than a long line. 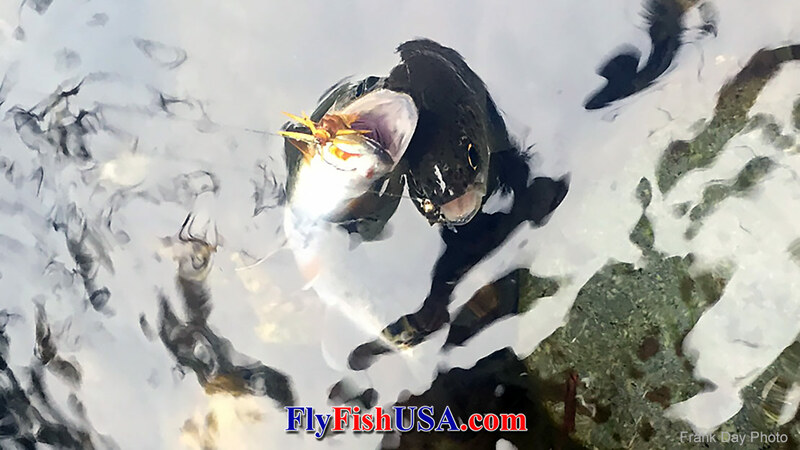 Allowing your flies to drift totally natural with the current along the bottom of the river is paramount when fishing for wise, suspicious trout. A long rod allows an angler to stand further from the fish when fishing a short line. A short, thin line makes it easier to control drag. The long thin rods made from modern graphite are much lighter in weight and telegraph subtle strikes much better than rods made in past years. Now there are several rods that can be changed in length and balance to fit the water or the circumstances. The Echo Shadow II and TFO Drift come to mind. There are advantages in being able to customize your tackle to fit the fishing conditions. A small stream might demand a nine-foot rod. Medium size water might fish best with a ten-foot rod. An eleven-foot rod is often appropriate for larger rivers. A rod that is scalable makes fishing nymphs more productive. However, on most rivers longer rods give more advantages than shorter ones. We used to use bright colored weight forward fly lines. But, fine diameter non-stretch shooting lines are very good nymph fishing lines. The weight of the nymphs is is what loads the rod for short casting. In most casts only the leader touches the water while nymph fishing. Leaders made from non-stretch materials telegraph feel better than ones made entirely from monofilament. All European trout tournaments demand that anglers fish with barbless hooks. This is just another good way of reducing trauma and angling mortality. As angling pressure has increased on our local trout streams it seems that many of the fish we catch are missing one or both maxillary flippers. I believe this is due to the fact that barbed hooks are often hard to remove, and sometimes the maxillary flipper gets torn from the fish (such as the trout above).